The project features improved visibility of the creek, an ADA-accessible interpretive pedestrian pathway, enhanced native rainbow trout habitat, new native trees and vegetation, and a new public restroom. This site will offer creek-related educational opportunities while improving water quality and flood control, creating habitat, reducing erosion, and protecting the adjacent roadway and homes. 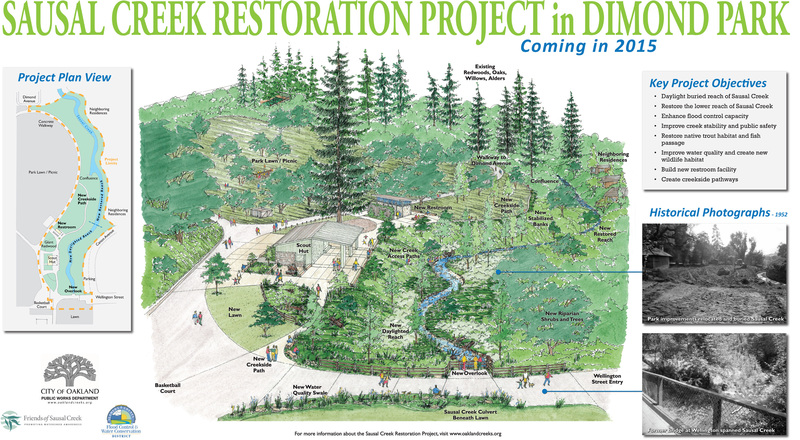 The goal of the Sausal Creek Restoration Project in Dimond Park is to create a sustainable, safe and healthy creek environment for fish, wildlife, adjacent properties and park users. The Sausal Creek restoration project is a collaborative effort by the City of Oakland, the Alameda County Flood Control & Water Conservation District and the Friends of Sausal Creek. The restoration focuses on the creek that runs through Dimond Park below Wellington Street. The project will remove the culvert below Wellington to open up a long-buried stretch of creek, and widen the existing creek to create a more stable, natural and diverse riparian corridor. Please watch the brief video discussing the restoration project.